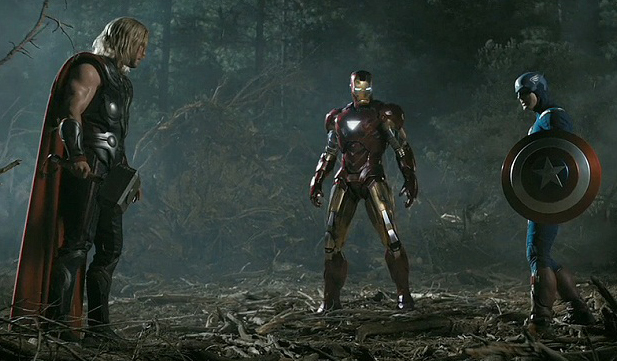 Like Lord of The Rings did for Peter Jackson, The Avengers will do for Joss Whedon. For with this movie, he has written the screenplay and directed and delivered a film that defines the term 'blockbuster'. Epitomising the 'united few against the individually unbeatable' concept of it's comic roots, the current generation will reference the impact of seeing The Avengers movie, in the same way mine do Superman. It is truly sensational. Oh, and Avengers has Hulk vs Loki. How is it one movie can have one half of your mind laughing at the humour, amazed at the plot twists and gob-smacked at the battle scenes, while the other half bangs on the cerebral ground screaming "This is how the comics should be!"? As Loki's plan to have humanity assume a more 'natural state' beneath his heel takes shape, so to do the forces that oppose him. In a stroke of genius they don't all join the fray at once, but rather in a drip-feed motion that benefits all characters involved. Just like Joss's run on the comic Astonishing X-Men, the friction between the main characters is glorious stuff, making you wonder if they will ever assemble at all. 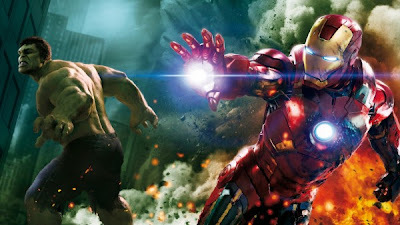 Hulk vs Thor (both times) may be the best slugfest(s) of any film. Cap's defence of Nick Fury's motives, Stark and Banner's common ground and the Black Widow matching wits with Loki - heck, the dialouge and the chemistry of both actors and roles is simply flawless. As The Helicarrier, officially steals the title of 'Hollywood's coolest vehicle', Robert Downey Jnr remains incredible as the show-stealing Iron Man/Tony Stark. While Pepper also features, and the movie explains how S.H.E.I.L.D. have moved Jane Foster to safety, it doesn't cover why War Machine isn't called in (at least not that I heard the first time round - and believe me there will be a few others). It's a small thing, but when the alien invasion strikes and the Mjolnir hits the fan, Tony could've really done with Rhodey's firepower, so it does stand out. Oh, and Avengers has Hulk vs Loki. As said forces and serpents reign down upon Manhattan, Avengers conveys an alien invasion like few in film have mustered. Having created a commanding presence in ending Thor's tiff with Iron Man, Chris Evans portrays a Captain America who refuses to give up, despite serious wounds suffered beside an armoured man, a demi-God and a Hulk. 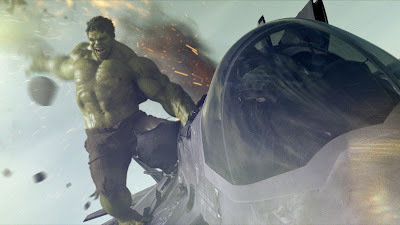 While Black Widow hitches a ride, Banner's 'Hulk controlling' secret is revealed and Hawkeye fires arrows with bulls-eye precision, you realise two key words are missing from the film. In their place, your mind's so busy sceaming over what's infront of you, you're not sure if you actually care. Oh, and Avengers has Hulk vs Loki. While like all Marvel films, it would have been nice if they could've worked more of a tip of the hat to artist and co-creator Jack Kirby into the proceedings, since Stan Lee again deservedly pops up, what Joss and every single hand employed by this film has done, both as a multi-film climax and individual piece will go down in movie history. Sure the films that lead to this destination may have had their dips, but as the after credits scene reveals the big bad Avengers 2 is going to tackle, you realise 'Earth's Mightiest debut' doesn't share that fate. Infact as I walked out of the theatre, the guy infront of me instantly turned his mobile on and said "Bro, just watched The Avengers..... FU!#KN' SICK!!!!!" Frankly, I couldn't have said it better myself. Believe me Craig, it is one of those super-hero films you can honestly say was worth waiting for. In fact I'm rewatching it this weekend! But I went to see it with a bad flu and the 3D glasses were very distracting :( and Icouldn't apreciated it the way I wanted. ergo, I think I'll try to watch it again next week. What do you people around the world. and Dan think about 3D movies? For my part I could pass without the upgrade. Ha - as you can tell from my review Aliera Hulk and Loki's flip flop was one of my favourite moments too. Glad you liked it! I saw Avengers in 2D, it starts screening in 3D in my city today which I will check out as well. Personally not many movies have actually made me feel 3D aside from the likes of Avatar and Alice in Wonderland - but this one sure didn't need any alterations to make you feel it's impact that's for sure! I loved the Idea of giving more exposure to the Hulk and Captain America. Jeremy Renner was a good pick as Hawkeye. He just oozes coolness! 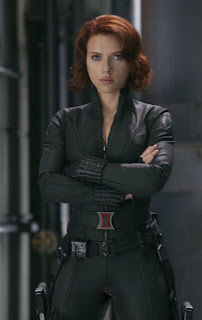 Didn't like the Black Widow character. She seemed out of place and I wish they could've gotten a different actress to portray here. Good movie though! Enjoyed it a lot! Reading that didn't make me feel any better about waiting 4 more days. Glad to see everyone's positive responses. My brother called last night about going to see it and he's sending out an email later this week to gather the troops so we can visit the theater en masse. I'm not much for the 3D experience. I thought Thor was better without it. Hey Annette and Chef Mikey - welcome to IADW! Annette, you are 110% right there. Tom Hiddleston really does bring so much to the character though. He really does make that role his own don't you think? Chef Mikey, the one thing I felt bad about leaving out of my review is how well Jeremy nailed Hawkeye. Unlike his criminally small scene in Thor, not only did The Avengers script give him some pretty sweet moments, Renner had the built in cool Clint is so well known for. Your own Avengers Assembling for the Avengers aye Craig, what an awesome idea. Let me know how you and the group find it! Hopefully youll not feel this spoiled anything for you. Actually I have to say I'm glad no visitor decided to post any of the main twists. What an awesome audience! I catch it this weekend on ye biggest screen in the city! And then on IMAX, yay!! Awedome stuff Pensol. Avengers deserves a massive screen like that! Let me know what you think! FAR Better than I was expecting. Nothing less than EPIC! And Yeah, the theater was Cheering, the Avengers were Kickin_ss, but the "Battle" between the Hulk and Loki was just... BEYOND EPIC!!! No doubt, THE, single Greatest Fight Scene, EVER!!! I mean, for me, Thor Iron Man and Captain America were Great... but The Hulk stole the show. Well, ok he stole the End of the show. But when Banner (Mark Ruffalo = Great!) revealed his "secret" for controlling the "Other Guy". And then turned to change into the Hulk. Well, ... when Banner "said what he said", and then turned to change. Did any of you feel as though he was changing into... You? Maybe it was just me (and my friend who was with me). But when Banner changed, you just knew it was all over as... "ARRRRRRH BOOOOM!!! Oh, did I mention the battle between the Hulk and Loki? Truly Incredible, and Absolutely Astonishing! Obviously for those of you who don't wear glasses, this won't work. But for those of you who do, Try it! Hey CBL! Glad you saw it and that tip sounds pretty handy too. I think in the Hulk vs Loki fight that's when I realised Avengers was going to be massive. Literally the whole audience I was in the first time around erupted with laughter. When you get that kind of investment from comic fan's and non-comic fan's alike, the only place you can go is up. I loved the two words that followed it too. Classic. But it really had the Astonishing X-Men feel to it too didn't it? Whedon really out did himself, just like he did there. I agree Mark Ruffalo was awesome as banner. Personally I even liked Eric Bana as Bruce better than Norton. I think the key to the character is someone who can act like the monster is just beneath the surface, not like they are two separate identities. When Mark yells in human form without changing, and you hear the savage in his voice, you realise this truly is a man with demons inside him.